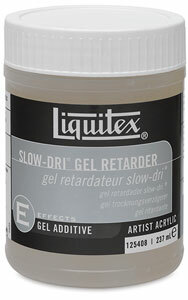 Use this additive with Liquitex Heavy Body Artist Color, Liquitex Heavy Body Mediums, and all other acrylic paints and mediums when working in low humidity, or whenever increased workability and blending time are desired. 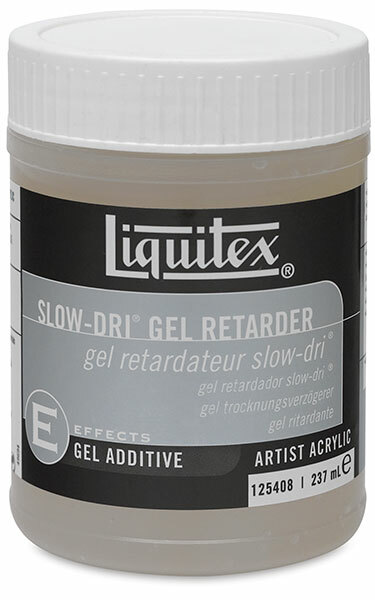 Similar to Slow-Dri Fluid Retarder (except in a heavy-body, thick consistency), Slow-Dri Gel Retarder also retains brushstrokes and adds body when added to to lower-viscosity colors such as Liquitex Soft Body Artist Color and Soft Body Mediums. Add no more than 25% to paint, as the absence of a binder may weaken the stability of the paint film if too much is added.